The Sunset Table with (1) 12" Leaf is crafted to meet your functional requirements without compromising style. Expand the middle leaf as you entertain extra party guests. Also, the top is big enough to make passing dishes a breeze. This dining room furniture features spindle legs for support and strength. In a two-tone finish, this country-style table blends in both traditional and modern room settings. Origin: Table is made in Thailand and Chairs are made in Malaysia. I did receive this notice a little blemish on one of the legs. I did call Jordan's about it , within a week I had someone come to my house and repair it .I m very happy with my set . My family loves the design and comfortable chairs. Perfect fit for what I needed. Love the self-storing leaf feature. The packaging was overkill. I had to use a screwdriver to pry the staples out to release the ties which caused gouging, but fortunately on the bottom. One screw was stripped so the leaf would not slide out. I fixed it with a wooden toothpick (a tip I learned from a craftsman) so it should hold. 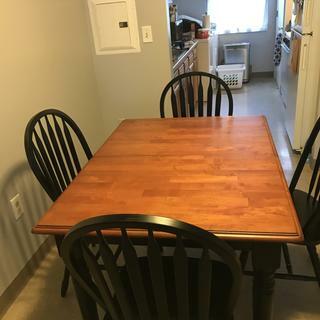 Overall a great table at a great price. Very happy with our buying experience at Jordans.The furniture is beautiful. The staff at Jordan's were very kind and helpful. Would definitely buy from Jordan's again. Love the table.easy to open.Delivery men were prompt and very nice. How many inches between the legs lengthwise to fit a bench? There is 37 1/2" between the legs on each side of the Sunset Table without the leaf in. There is 24" between the legs on the ends. Greetings! Are the dimensions shown expanded or not? What are the dimensions in the other configuration? The Sunset Trading table has the following dimensions with the leaf 48"L x 36"D x 30"H . The table comes with one 12 inch leaf. What color are the legs? Black or grey? The Sunset Trading Table has a black finish on the legs.